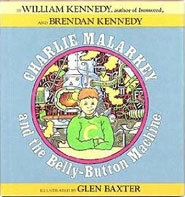 Kennedy has also co-authored two children’s books with his son, Brendan Kennedy: Charlie Malarkey and the Belly Button Machine (1986), and Charlie Malarkey and the Singing Moose (1993). The first book began as an ongoing, extemporaneous bedtime story that William Kennedy told his four-year-old son in 1974. Kennedy decided the story was getting good enough to put down on paper, and brought Brendan into the creation of the rest of the tale. Kennedy credits Brendan with major contributions to the plot and dialogue. When finished it made the rounds of publishing houses and was rejected many times, like Kennedy’s most famous novel, Ironweed. One editor feared it was too Freudian, and others felt that missing body parts would frighten children. But Kennedy persisted, knowing that children enjoyed it enormously, and addictively. 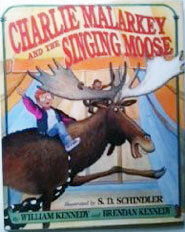 The book was published by Atlantic Monthly Press when editor Joyce Johnson read and loved it.